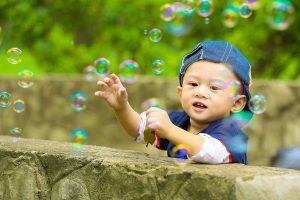 Why Reasoning in preschool age is important for Development? Extended play with constructional toys. Enjoy 6+ pieces formboard and simple Jigsaw Puzzles. They can visualize shapes in different positions and learn to describe the direction, distance, and location of objects in space. Communicating about their ideas. Ability to use the imagination to invent something new or to generate new ideas. Giving suggestion and strategies for solving a normal puzzle. Ability to distinguish fantacy from reality. Changes in above pattern with some following acute changes show some hint to something happening in child life that is not usual. The intense anxiety and fear that often follow a disaster can be especially troubling for surviving children, especially if other children were victims of the disaster. They show some unusual pattern of reasoning. Some may demonstrate younger behaviors such as thumb sucking or bed-wetting. Children may be more prone to having nightmares and the fear of sleeping alone. Performance in normal reasoning may suffer. Other changes in behavior patterns may include throwing tantrums more frequently, or withdrawing and becoming more solitary (Ms. Surabhika Maheshwari, Dr. Cherian Varghese, Dr. Kavita Venkataraman, Dr. Vijaya Chandra; WHO). Ensure the child is safe and is being looked after by a caring and responsible adult. As far as possible, do not institutionalize or adopt the child out. Be sensitive to knowing that a child often finds a toy or object or photograph comforting and that they may choose to wear or carry it around with them constantly. Ensure regular monitoring of children who have been orphaned; check where they sleep; what their activities have been during the day and whether they feel safe. Provide resources for children to play with, to occupy themselves or to express themselves through. Arrange informal gatherings for children at places close-by to their families or new home bases so that children have the opportunity to play and talk together. Listen to children’s stories. Often children are more comfortable expressing their feelings and experiences through make-believe stories or using objects. This entry was posted in Child Development, Child psychologist, Cognitive Development on February 22, 2012 by epsychology. Thanks for every other excellent article. Where else may anyone get that kind of info in such a perfect manner of writing? I have a presentation next week, and I’m at the look for such information. This site is actually interesting i’m craving for is there any other examples? however anyway thanks much because I found that i used to be longing for. Hello There. I found your blog using msn. This is a really well written article. I’ll be sure to bookmark it and return to read more of Reasoning in preschool children and understand when they need help | ::ePsychology :: Spit out your Thought . Thanks for the post. I will definitely return. I was more than happy to search out this net-site.I wanted to thanks to your time for this wonderful learn!! I positively having fun with each little bit of it and I’ve you bookmarked to check out new stuff you blog post. It’s actually a nice and useful piece of information. I am happy that you just shared this useful information with us. Please keep us up to date like this. Thank you for sharing.